Scan any event-themed Pinterest board or flip through any wedding magazine and you’ll find tablescapes in abundance. Crisp, bold linens, one-of-a-kind centerpieces and elaborate place settings come together to form one of the most popular—and impactful—aspects of an event: the table design. Table styling has grown well beyond the white tablecloths and folded napkins of the past. Once a necessary seating arrangement, guest tables today are often the focal center of attention with extra detail given to the guest experience. Couples and clients are being influenced by tablescape inspiration from every direction. 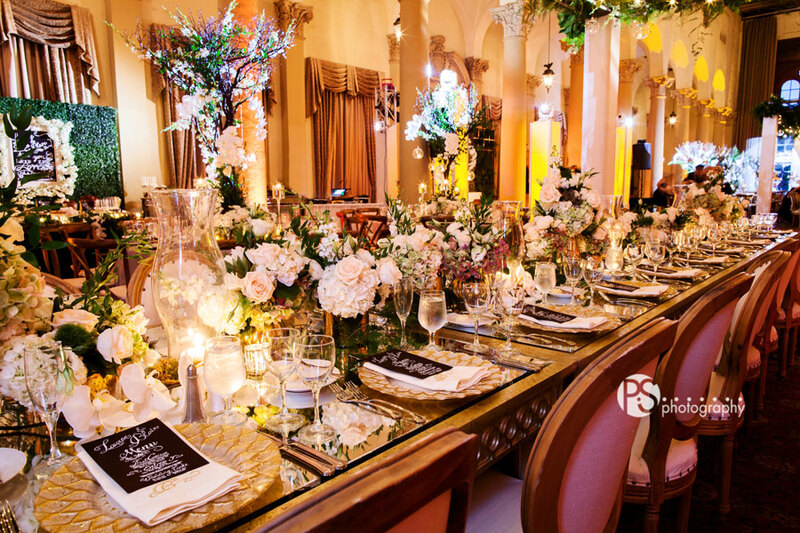 As event professionals, it’s up to us to understand not just the basics of table styling, but also how to turn a simple design into a fully customized look that brings the client’s vision to life. Here are some quick tips for tabletop design that will help you sell and style a client’s dream table. You may able to whip up the prettiest place setting, but it won’t be a success unless it matches the client’s desires. Get to know what they want early by looking at the photos that inspire their vision and ask them which details particularly stand out to them. This is the ideal time to talk budget—many clients don’t fully realize the added costs that can build up from chargers, mats, centerpieces, linens, napkins and the like. Be open and straightforward with them so they go into the process understanding the total cost of décor rentals. At the very least, we recommend starting with premium linens. A nice linen can make simple décor features shine, and can also have a major impact on the event space as a whole. The next step would be to upgrade the chairs to an option that pairs well with the new linens—whether that’s a modern or classic look. From there, you can begin to look at combinations of chargers, china, glassware and flatware for each place setting—sticking with your client’s budget, of course. If possible, connect with your rental supplier to set up a sample table for your client to see in person. Trends dictate the desires of event clients from year to year, so it’s essential to stay up-to-date with what’s in style. Social media is a great place to start, but be prepared to look beyond the latest hashtags. Interior design trends tend to precede those in the events industry, so take some time to shop furniture and home décor stores and catalogs for ideas. This year, we’re seeing velvet, metallic, floral and jewel-tone details taking center stage in the events industry. The clean, modern look of yesterday remains popular too. No matter a client’s preference, table styling can be one of the most enjoyable parts of planning—work closely with your client, get creative and have fun with it!